A two-point win for Jim Gavin’s side tonight. 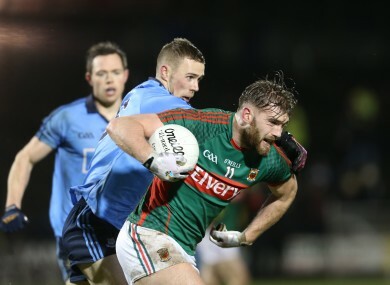 Aidan O'Shea on the attack for Mayo in tonight's game against Dublin. THE MARGIN OF victory wasn’t as great as the walloping they dished out in Castlebar last March but Dublin still departed Elvery’s MacHale Park on a winning note after tonight’s league clash. A tough and uncompromising encounter in wretched weather conditions culminated in a two-point success for Jim Gavin’s side. Dublin lost Philly McMahon to a black card in the early stages while both sides finished with 14 men after the dismissals of Colm Boyle and John Small. Mayo’s fans may have feared this game as their stretched squad entered the match on the back of faltering badly against Cork last Sunday. They produced a heartening showing to test Dublin yet are still pointless after two games whereas Dublin have strung together two successive wins. Dublin were in front 0-4 to 0-3 at the interval with Dean Rock’s placed ball markmanship key in both halves as he struck 0-4 overall. Scores were hard to come by for both sides, best encapsulated by the fact that it was 0-1 apiece by the 18th minute. Yet Dublin had different players who could chip in with Diarmuid Connolly and Denis Bastick scoring in the opening-half while James McCarthy, Cormac Costello and Emmet Ó Conghaile raised white flags in the second-half. Goalkeeper Rob Hennelly and attacker Evan Regan were the principal scoretakers for a Mayo team that suffered from slipping 0-7 to 0-4 behind in the second-half. That was a deficit they could now claw back despite being only two adrift on a couple of occasions. Scorers for Dublin: Dean Rock 0-4 (0-3f, 0-1 ’45), Emmet Ó Conghaile, James McCarthy, Denis Bastick, Diarmuid Connolly, Cormac Costello 0-1 each. Scorers for Mayo: Evan Regan 0-4 (0-3f), Rob Hennelly 0-2 (0-2 ’45), Diarmuid O’Connor 0-1. Email “Dublin edge out Mayo in Division 1 dogfight in Castlebar”. Feedback on “Dublin edge out Mayo in Division 1 dogfight in Castlebar”.